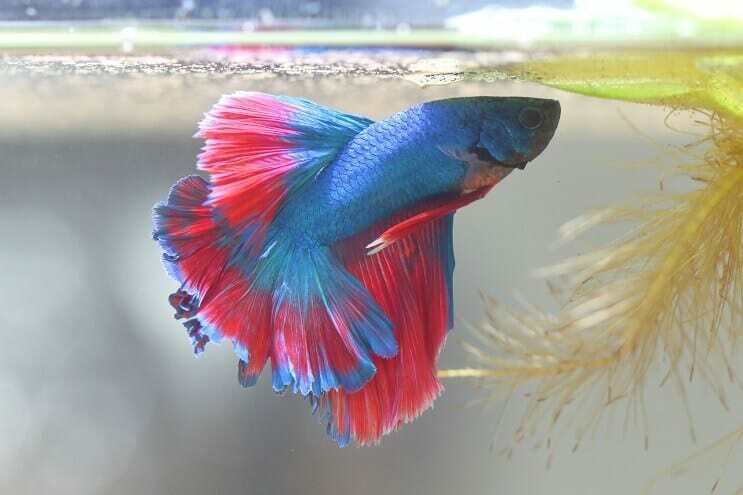 Bettas are vibrant colored fish with long flowing fins and are very popular among aquarists. There are hundreds of different varieties of Betta fish, all with different shaped tails, patterns and coloring. 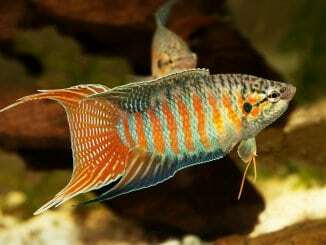 Some people choose to breed these fish to create new varieties, some choose to breed them for shows, and others want to breed a very particular variety based on tail type, color and pattern. The most likely reason for you wanting to breed Bettas is just to add a new level of interest to your hobby. 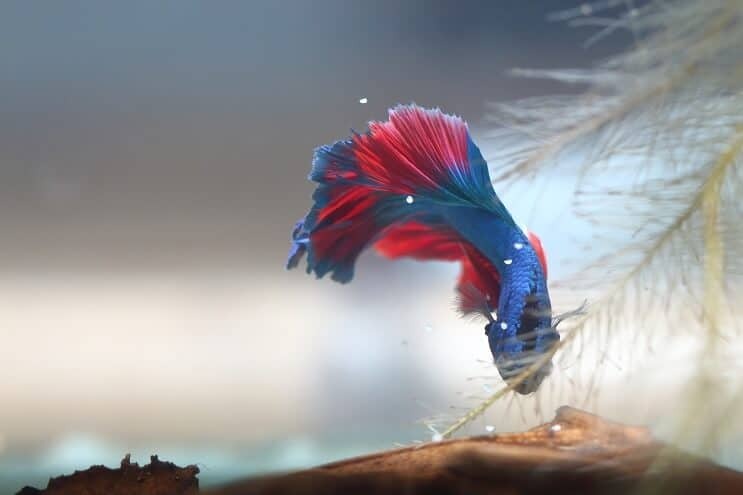 Whatever your reason for wanting to breed Betta fish, you need to understand how to select the right breeding pair, how to create the right tank conditions and how to raise the fry. We will cover all this and more in the article below. At a bare minimum you’ll need two tanks to breed Betta; the permanent home and the breeding tank. However some people choose to have a more elaborate setup, using one tank for each of the adult fish, a breeding tank and a tank for the fry. There are a few different options when it comes to your Betta tank setup. If you don’t want to use lots of separate tanks, you’ll need to use a divider to keep the males and females separate. You’ll most likely have heard that Bettas will be fine in tiny 1 gallon tanks, or even worse a vase – this isn’t true. Whilst they are native to the shallow rice paddies in Thailand, they still have access to miles and miles of water in their natural habitat. 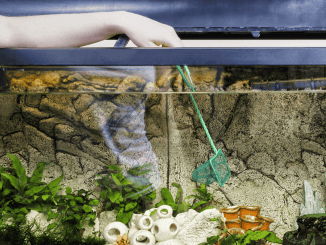 Therefore your Betta fish tank will need to be at least 5 gallons; you’ll need a heater and a filter, some live plants such as java moss or java fern, some hiding places (you can achieve this with rocks and caves) and smooth gravel. As with any other fish tank setup, you will need to make sure the tanks that you set up for your Bettas are fully cycled before you introduce them. Introducing fish to a new tank which has not been cycled will most likely be fatal for them. In addition to the permanent tank, you will also need a breeding tank for your Bettas. This will be a stripped down tank compared to the permanent set up. Set your tank up somewhere quiet; they like privacy when breeding so keep it away from busy areas and other busy aquariums. Fill the tank with three to five inches of water and add your heater and filter. The breeding tank will need a heater to keep the water at around 78°F. Some people choose to use filtration, and others don’t. Using filtration will create a small current in the water which can disturb the bubble nest so if you do choose to use a filter, don’t use a powerful one. Don’t use any gravel, because the eggs might settle in it, leave it bare bottomed. It’s essential to have hiding places due to the aggressive nature of the males when breeding. You can use plants to provide hiding places; the plants also provide a place for small organisms to grow which the fry can eat. Java fern is an ideal plant to use, or if you don’t want to include live plants you can use plastic ones. You’ll need something that will float on the surface of the water, to provide a surface for the male to build his bubble nest. A couple of popular choices are to use a piece of Styrofoam or an almond leaf. As for lighting, Bettas need privacy to breed and won’t spawn if it’s too bright, so only use a dim light. It’s also important to ensure the breeding tank has been properly cycled. This process takes around 4-6 weeks so always do this in advance. When it comes to selecting the breeding pair, you will need to think about the type of Betta you are trying to create. 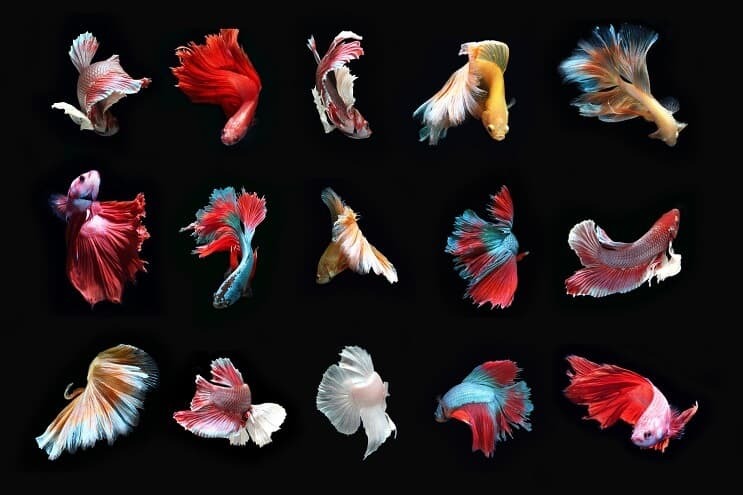 Select fish with the characteristics that you want to breed, for example if you want Crowntail Betta, you’ll need to choose the adult fish with the coloring you want to achieve. The fish you choose should be actively swimming around, with no sign of disease or infection. 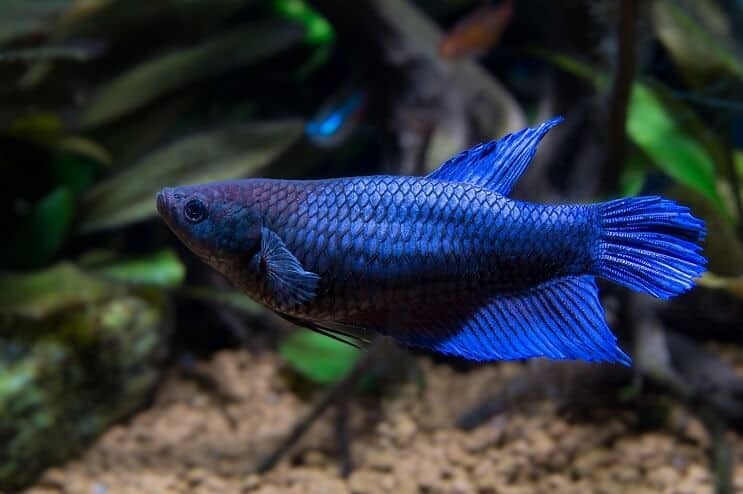 Your Betta should be free from parasites, disease and fungus. Make sure they are not lethargic or lying on the floor of the tank. Their eyes should not be bulging and should be clear. You should also check their scales and fins for any sign of fungus, damages or tears. The age of the fish that is also important. Bettas are at their peak for breeding between four and 12 months. Older fish are still able to breed, but you will have more success with younger ones. Finally, you need to consider the size of the fish. They should be roughly the same size, and the female should be slightly smaller than the male. Never use a large female and a smaller male. In the wild, it is the female Betta that selects the male Betta based on their size, color, fin length and the quality of their bubble nest. However in captivity, the likelihood is you have already chosen a pair to mate so you need to ensure the conditions are optimal. Once you’ve created the right tank conditions, you need to make sure that the fish are conditioned so that they are able to breed effectively. Breeding is not easy work. Your fish need to be conditioned to ensure they have enough stamina and are able to withstand the stress which they will endure during courting and spawning. The more effectively you condition the pair, the more likely it is that the female will produce enough eggs, and the male will have enough energy to care for them. You should allow a minimum of two weeks to condition the fish, more experienced and committed breeders will allow even longer. To condition them you need to feed them high quality food in small amounts, between two to four times per day. Live foods are the best way to do this. You can use bloodworms, daphnia, finely chopped meat, tubifex worms and small insects such as crickets and roaches. If you don’t have access to live foods, frozen substitutes will also work. Now comes the exciting part. It’s time to introduce the female to the male; this is not a quick process and you need to do it slowly. Let her adjust to her new setting for around 30 minutes before introducing the male. If you’ve using a divider, you will add the male to the opposite side of the tank and allow him to swim around. You will notice that the male turns a deeper shade of color and will start to flare his fins in an attempt to impress the female. You might notice him nipping the container that she is in (this is to be expected). If the female is interested in him, her color will also darken and she will display vertical stripes across her body, known as her barring pattern. Her oviposter (a small white tube which she lays eggs from) will also protrude behind the ventral fin. You may also notice she wags her body back at him. The male will usually build a bubble nest within 24 hours of seeing the female. The bubble nest is made from air bubbles which are made by the Betta and they’re coated in saliva to make them durable. The bubble nest will usually be built next to an object that breaks the water, such as the Styrofoam or the leaf. Sometimes they are built at the surface of the water and sometimes they are built just below whatever is floating. Once the nest is made, you can release the female into the tank. This is usually around 12-24 hours after first introducing them. If you chose to use a small container, make sure you don’t leave her in there for longer than an hour and move her back to the permanent tank while the male builds his nest. If you used a divider, you can now remove it and allow the female access to the whole tank. If you used a small container, sit the female in it for another half an hour and then add her to the tank. She will most likely swim straight to the bubble nest to inspect it. If it’s not up to scratch, she will either swim away or destroy it. If she does destroy it, remove the female and start the process again. If she destroys it a second time you may need to find another pairing. When the male has spotted that the female is within his reach, his displays will become more impressive and he will start to chase her around the tank. It is normal to see chasing and biting for a few hours, but it’s still important to keep a close eye during this stage and be ready to intervene if things turn nasty. They start to perform a dance where they swim next to each other and flare their fins every inch or so. The male will chase her and nip at her fins if she isn’t responding; she may also need somewhere to hide (this is why plants or hiding places are so important). This will continue until the female is ready to spawn. The signs which females display indicating they are ready to spawn depends on their nature. Some females show their submissiveness straight away, swimming up to the male with their head down and fins by their side, others will charge at the nest. A quick note – neither fish should be fed during courtship. Once she is ready, the mating dance will begin. The aim of the male is to flip the female upside down, and wrap himself around her to fertilize the eggs as she releases them. Once he has achieved this, they will either stay floating or sink to the bottom. He’ll then release her and she’ll have a few minutes to recover before trying again. After they’ve performed a few of these squeezes, the female will begin to drop eggs each time they embrace. This embrace is not to help her release the eggs, but to increase the likelihood that the eggs are fertilized as their ventrals are close together this way. The female may float sideways and look lifeless while she lays the eggs, but this is normal! This process can last anywhere from a few minutes to a few hours. Most Bettas lay between 30-40 eggs per spawn but some can lay up to 500. The male will start to catch all the eggs, taking them up to the nest. Some females help with this process once they’re recovered, but others tend to eat the eggs so it’s advisable to remove the female as soon as she has recovered. This is also advisable because the male may attack her because he sees her as threat. Once the female has been removed, cover the tank with plastic wrap to keep the moisture and heat in. This creates a humid environment and helps hatch the eggs and develop the fry. When the female has finished laying eggs, the male will release milt into the tank to externally fertilize the eggs. Over the next day or two, the male will spend his time catching any falling eggs and blowing more bubbles. Sometimes they build new nests and move the eggs there. Sometimes they will eat the occasional one, perhaps if they haven’t been fertilized properly. Over the first 36 hours, the fry will use up all the oxygen in the bubbles, which causes them to collapse. As the fry start to hatch, they fall from the bubbles and the male will catch them and put them back. You can expect the fry to stay in the bubbles with their tail hanging down for 2-3 days until they’re ready to swim horizontally by around day 4. As soon as the fry are free swimming, the male will need to be removed. Or if you have a fry raising tank the fry can be moved there. It can take up to four months to raise the fry to adulthood so you will need plenty of food. They will need small foods such as brine shrimp, infurisa or microworms. If you want to breed fish, Bettas are a popular choice for all aquarists. For beginners, they offer an easy introduction into breeding because the process is relativity simple and easy to follow. 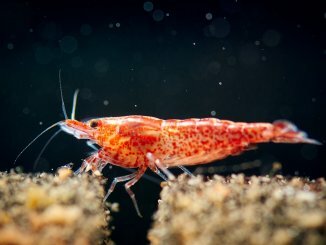 For more experienced aquarists it gives them the chance to hone their skills and create perfect breed species. 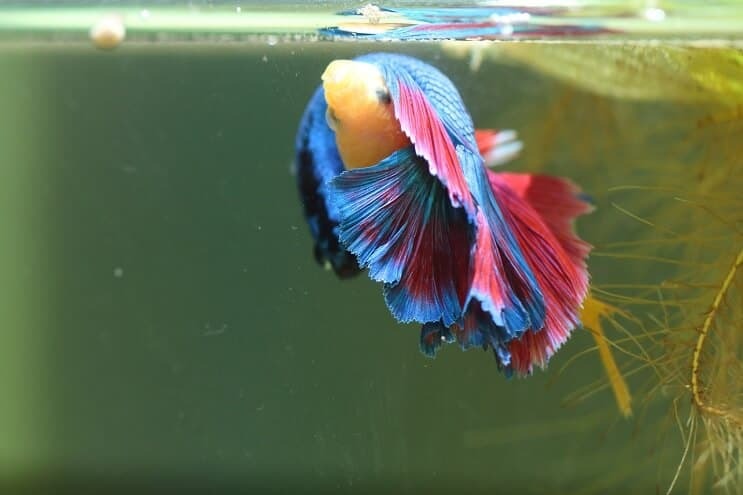 Whatever your reason for wanting to breed Bettas, as long as you follow the guidance in this article and breed responsibly, you can’t go too far wrong. Ensure that the tank conditions are correct, the female is introduced properly and the fry are fed the correct fish food and you’ll be raising Betta in no time.